The great awakening is accelerating like never before. The [CB] is putting the fear into the people in the UK. If there is no deal they won't be able to make trade deals with the WTO and they will be in a 30 year recession, think mirror, the economy will boom and it will reflect on [CB]. The new BREXIT date is set for Feb 14. Shoppers around the country applied for store credit cards, this was a 30% increase, other received higher credit limits because of the new FICO calculation. Trump tweets that because of the tariffs the steel industry is back. "In 2020, the great likelihood is that an independent would just split the anti-Trump vote and end up re-electing the President.That's a risk I refused to run in 2016 and we can't afford to run it now," Bloomberg added. 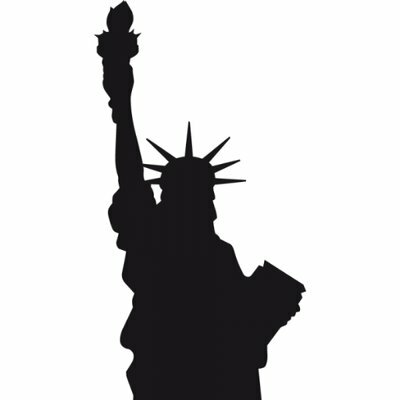 "We must remain united, and we must not allow any candidate to divide or fracture us. The stakes couldn’t be higher." 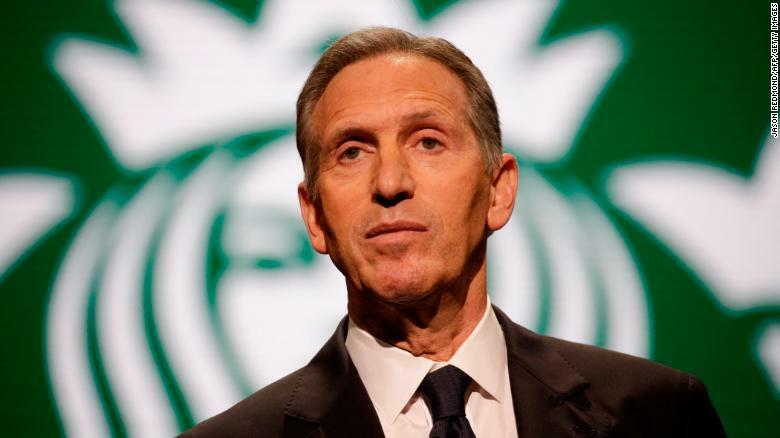 rogress, called for a Starbucks boycott if Schultz enters the race, tweeting: "Vanity projects that help destroy democracy are disgusting. 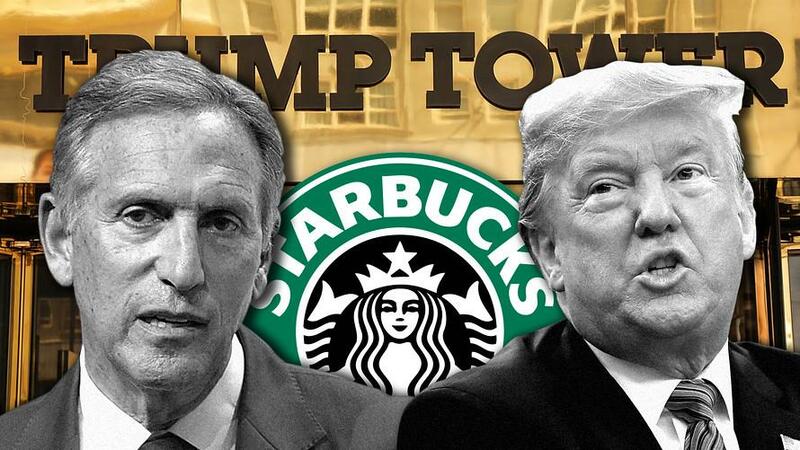 If he enters the race, I will start a Starbucks boycott because I’m not giving a penny that will end up in the election coffers of a guy who will help Trump win." Trumps plan is all coming into motion and the Democrats are scrambling to recover. They are once again using the MSM to spread their lies and deception. A win for Pelosi? I think not. Get ready for an amazing blasting from Trump during the SOTU. There is no way around this and to dream and hope of a Utopian scenario, although noble, is a fallacy and as we have seen throughout history, time and time again, it leads to nothing but chaos, anarchy and destruction. Over the past few years, I have followed the deteriorating state that Venezuela has descended into under the leadership of President Nicolas Maduro. Predicting that it would eventually end disastrously. Sadly, this is nothing to rejoice, as millions of people have suffered untold hardships, as hunger has wracked the nation of Venezuela, with those being capable of doing so, fleeing the country before it was too late. Unfortunately, as is typical in these scenarios, many have not had the means to escape the suffering and have now found themselves utterly trapped as this dreadful timeline has progressed. Finally, I believe that this may be all coming to a boiling point and will soon reach a catastrophic crescendo, where one side or the other makes a move that will leave the country scrambling to recover from. 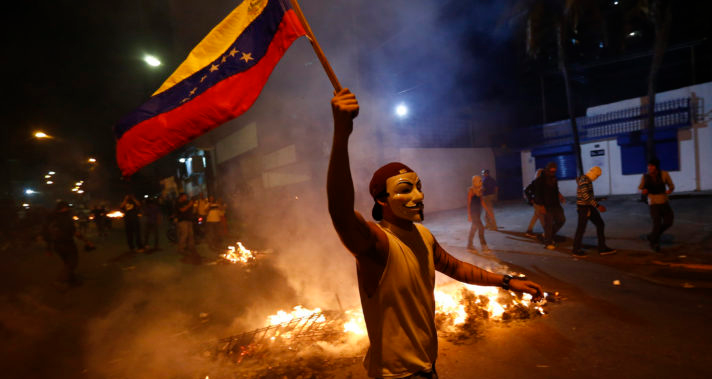 Juan Guaidó, the 35-year-old National Assembly leader has recently sensed Maduro's weakness as well and has thus made a powerful and bold move, that may cost him his life if he is not victorious. Declaring himself the "intern" President of Venezuela, he has deemed that sitting government has competed heinous crimes against the state and broken the people's constitutional rights, therefore needing to be removed from office. Of course, Maduro has rejected this outright and has once again cracked down on those who would attempt to remove him from office. This of course would be his reaction, as to do so now, would mean his destruction. In his mind, he has no other option and must do what he needs to do to survive the current increasingly hostile situation that is developing minute by minute, as we speak. However, he may not be able to contain this new uprising, as powerful forces are backing Juan Guaidó, both within the country and from an international stage. Still, this struggle is far from over and Juan Guaidó will have to convince a large portion of those who stand on the sidelines to rise up and join him. Top and foremost, he needs to convince the military to back him if he hopes to break Maduro's grasp over the people of Venezuela, something, he has yet been unable to do so. This is a story that is going to continue to develop at breakneck speed, until something snaps. Hopefully, in the end, the people and the country of Venezuela will come out stronger and the better, allowing it to move down the path towards growth, healing and recovery, all of which it desperately needs. Is it "immoral" for there to be billionaires? Well, that depends on how they acquired their wealth. If it's done legitimately, by voluntarily exchanging for their products and services, then of course it's moral! However, if government force or laws are used to acquire wealth, that's a different story. The Federal Reserve system favors the latter. Ron Paul discusses on today's Liberty Report! Corruption: Was CNN Tipped Off By FBI Ahead Of Stone Arrest? 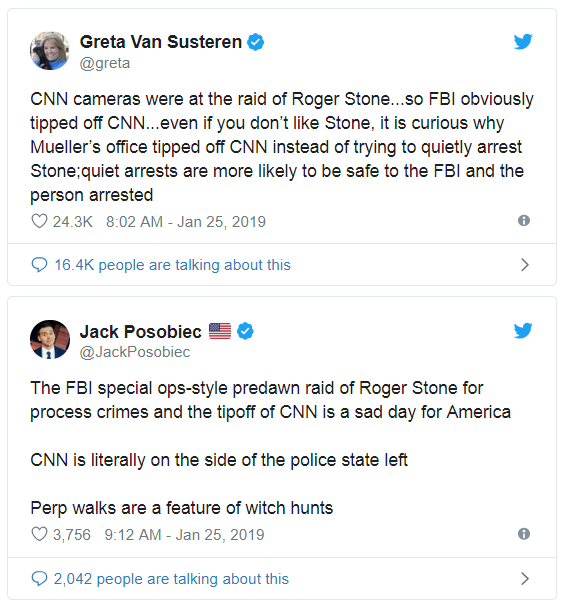 "CNN cameras were at the raid of Roger Stone…so FBI obviously tipped off CNN…even if you don’t like Stone, it is curious why Mueller’s office tipped off CNN instead of trying to quietly arrest Stone;quiet arrests are more likely to be safe to the FBI and the person arrested." Meanwhile, many are questioning the decision to conduct a "heavy raid" on Stone for lying to Congress, while others connected to the Trump campaign such as Paul Manafort have been allowed to simply turn themselves in? Federal Reserves Policies Quietly Bankrupt the US Pension System. Stephen Roach Asks “is Apple The Canary In The Coal Mine” The 2019 Secular Shift: Beginning The Long, Difficult Road. Trump has them backed into a corner. FED Chairman Powell, who for a time, was appearing to go rogue and stray off the beaten path of loose monetary policy, paved by so many of his predecessors, has collapsed his resistance and utterly given in to the demands of the market. At a forum hosted by the American Economic Association in Atlanta last Friday, FED Chairman Powell was a "good boy" and did exactly what Wall St demanded. He stuck to a well written script of carefully selected words, focusing time and time again on a few in particular, but most notably the word "patient". The context that this word was used in, was in reference to raising interest rates. As we have noted in previous articles, the hawkish approach adopted by FED Chairman Powell was ill received by the markets and President Trump, the latter of which has been an open feud with the FED. Like his predecessor, Janet Yellen, who also carefully chose to the word "patient". Powell intentionally selected this word, as he knew it would signal to the markets, that also like Yellen, he was willing to put on the velvet gloves when it came to handling the markets. These comments immediately caused a sharp rise in the market, as stocks rallied following this new found approach from the FED Chairman, as it gave the market exactly what it wanted, or rather demanded. Obviously, Wall St could already smell the blood in the water before Powell even took to the stage, as even before his comments were made, a rally had begun, signalling that at least a few key players anticipated what was to come. In addition to this new dovish approach, Powell's carefully scripted speech also removed the word "autopilot", a word that was previously uttered by himself and other members of the FED, and of which did not sit well with market participants. FED Chairman Powell has given into the pressures of the market and has given up hope of attempting to regulate rates and the flow of easy money. This can only be summed up as a "win" for Wall St, but at what cost to the long term health of the economy as a whole? 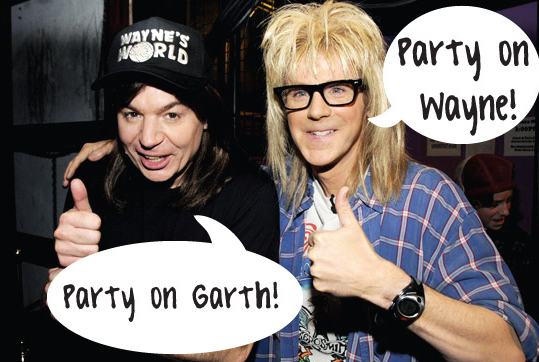 The FED has completely and utterly capitulated to the market, prolonging the inevitable hangover that is yet to come. The EU is getting exactly what they want, a delay in the BREXIT which means there is no BREXIT, the EU might even try to get the UK to vote again on the BREXIT. May like Trump and Macron will not go to Davos. The globalist agenda is falling apart and the leaders are trying to tape it back together. IMF says no deal BREXIT will not work. Canada says can't give trade data because of the US shutdown, come to find out they get their data from the US. Trump is planning for the reset and the total destruction of the central bank system. Earning season does not look good, companies are not doing as we were told. The economic illusion the Central Bank created is now falling apart, it will be showing up in the people's sector and not the stock market, not the statistical numbers. Trump and team will be moving quickly to prepare the country for the transition. Certain Fed officials are trying to control the narrative but Powell continues with with plan. Russia is continuing to de-dollarize and says gold will be very important moving forward. May caves, offer's Brexit deal concessions, this deal again is not for the people it is for the central bank, it needs to be scrapped. The holiday season did not go as well as everyone thought, Macy's and now Kohl's are reporting weak sales. The automobile apocalypse is hitting China hard, the central bank economy is bring down the global system, the weight of debt cannot be sustained. Ford to cut jobs in EU but bring jobs back to the US. The MSM continue to push recession in 2020, Trump says no recession, now Powell is agreeing with Trump. While we look inward and fight among one another, becoming increasingly polarized and isolated into our various political "camps", ceasing any form of communication with each other, our economic rivals are racing past us, forming partnerships and making plans. While our financial "gurus" continue to shuffle pieces of paper back and forth between each other, trading digital numbers in ever increasingly quantities, as if they had any real, true intrinsic value. Both countries have made it blatantly obvious that they are not happy with the current "status quo" and would love to see an eventual change. That change being a toppling of the US Dollar as the reserve currency of the world. Meanwhile, China, who has remained tight lipped about their gold purchases since 2016 has once again made another power play, announcing an increase in "official" gold holdings, a rare occurrence for them. 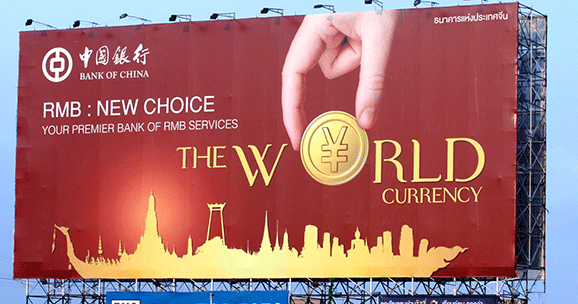 Chinese reserves now stand at a staggering 59.26 million ounces, but why now, why after two years of remaining silent, and then six years before that, have they now decided to let the world know that they are continuing to diversify and move into precious metals? As he states, none of this is going to happen overnight, as no one, not even those who plan to take the throne want to completely over tip the "apple cart", there is simply too much on the line and too much to lose. Tuur Demeester, founder of Adamant Capital, provides a broad update on cryptocurrency markets. He shares his analysis of the 2018 crypto selloff as well as his future market outlook. Additionally, Demeester discusses his view of the future of blockchain based smart contracts, payment processing, and asset tokenization. Following the worst year for stocks in a decade, Philip Kennedy sees a massive stock market decline in the next 18 months. Kennedy thinks the stock market has hit a high and it's down from here. When the crash occurs, he sees the Dow/gold ratio falling significantly. It's about 20/1 right now. He says it could fall as low as 0.5/1. While Bitcoin did not do well in 2018, it is still up 400% in the last two years. Kennedy sees Bitcoin rising in 2019. He explains why Bitcoin is the "hardest" money ever created, even harder than gold. He also discusses his views on other crypto-currencies. Warning signs are flashing for the economy. Will 2019 be the year the Fed pushes the dollar into the trashcan? Or will Congress' continued funding of the warfare-welfare state get us to economic ruin first? Former CIA Officer and whistle blower Kevin Shipp predicts a big reset of the U.S. dollar coming sooner than later. Shipp says, “Yes, I do. It’s going to be horrible if the dollar loses its reserve status. I think they will absolutely do that. I think, also, if you add that ‘missing’ $21 trillion, our deficit is actually double what is being said in public. What does a reset look like to the guy on the street? Shipp says, “First of all, the dollar plummets in value. That is going to affect everyone’s financial life in this country. They will devalue the dollar, which is going to take us into a very serious recession. 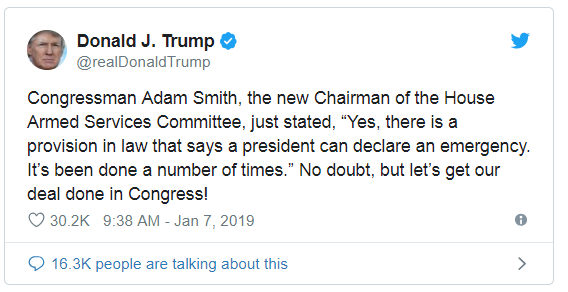 On Sunday, ABC's "This Week" host George Stephanopoulos asked Smith "Does President Trump have the ability, have the authority to declare a national emergency and have the military build his wall?" "Well, unfortunately, the short answer is yes," replied Smith. "There is a provision in the law that says the president can declare an emergency. It’s been done a number of times, but primarily it’s been done to build facilities in Afghanistan and Iraq. In this case, I think the president would be wide open to a court challenge saying, where is the emergency? You have to establish that in order to do this. Beyond that, this would be a terrible use of Department of Defense dollars." "The president spends most of his time talking about how we’re not spending enough on national security, now he wants to take $20 billion out of defense budget to build a wall. Which by the way, is not going to improve our border security. The president seems unaware of this, but we have actually already built a wall across much of the border, and all border security experts that I talk to say, where a wall makes sense, it’s already been built. We should have a conversation about border security, but first, we should we open the government and pay our border patrol agents and the federal agents that are furloughed," Smith added. As you make your new years resolutions, make sure you allot some room for some much needed protection as we head into 2019 and beyond. 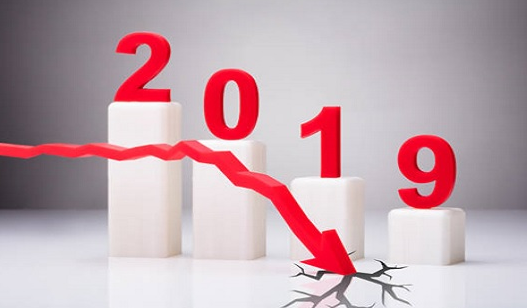 It may not be the rosy picture that many of you were hoping for, but sadly, 2019 appears destined to be one of increased chaos, turmoil and outright confusion. The chief driver of this is undoubtedly going to be the current disheveled state of affairs that we are watching unfold within the United States. As we enter into another week of government shutdowns, we are getting just a small sample of what this year has in store, as we haven't seen anything yet and I believe the madness witnessed throughout 2018 was just an opening act for what 2019 has in store. President Trump is being challenged on all sides and I believe at this point moving forward we are going to see some very serious and drastic changes within his administration, as he rapidly clears house of anyone who he believes belongs to the "old establishment", replacing them with those whom he deems "loyal" to him. In addition to this, we are going to see him use every weapon in his arsenal to jam through as much of his agenda as he possibly can, within his legal powers. This is going to enrage his opponents and embolden his die hard supporters, all while doing damage to the system as a whole in the long run. At this point, from a personal perspective the left has left him little to no options, as he is now fighting for his and his families survival, all of which his opponents would love to see behind bars, no matter the ramifications that this would cause to the very fabric of the United States. Meanwhile, emboldened by their recent victories, the radical far left elements within the Democratic party are going to come fast and hard at Trump, attempting to take him down as viciously as they can. This is going to lead to a powder keg of an explosion as we move throughout 2019, as markets are tossed back in forth in a gruesome and bloody manner, rocking the very foundations of Wall Street. Sadly, I believe that all of this is unavoidable at this point, as both the radical left and the far right have entered into such deep echo chambers that only a massive calamity is going to shake them out of it at this point. The time for discussion in these peoples eyes is over. 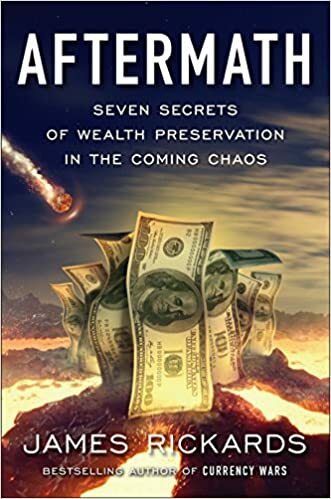 As this chaos erupts and markets begins to deflate throughout 2019, this increased uncertainty is going to have a compounding effect as money is pulled out of the system, perhaps even triggering another economic collapse similar to what was witnessed in 2008. As bad as all of this will be, there will be one place of safety, one rock of certainty that has always and will always provide the much needed insurance in these times of increased political upheaval. Gold and silver will be that safety and are ripe for a recovery after being battered for years on end. They are destined to move higher and break free of the shackles that have been placed on them and like beach balloon suppressed deep under water, are ready to rocket higher. The sparks are flying all around us. The fire is inevitable. Preparation is vital. Do You See What is Happening? If Not You Need To Get Prepared! Auto sales have been declining for a while, they used channel stuffing to hide the fact that they weren't selling cars, now it is completely noticeable so the automakers will no longer report monthly sales. Construction workers are being let go. Manufacturing is declining along with the stock market. Apple declines and many other companies will decline. Trump used the Tariffs to bring revenue,even the playing field and have companies stock up on supplies. The Fed is trying to save face by saying they might not raise rates in 2019. The Fed is the target and the MSM is trying to convince everyone that the Fed needs to be independent. Gold and silver showed strength this week as the Federal Reserve nudged the Fed funds rate 25 basis points higher and various equities in the US stock market reached bear market territory. Silver spot price appears to be closing the week around $14.70 oz, while gold spot price should close near the $1,260 US dollar per troy ounce mark. With us this week is a returning guest to the podcast... topics discussed include the recent Fed funds rate increase, the recent rollover in major US stock values, what is in store for the US dollar and gold in the year to come. The US real estate market, and finally a micro level discussion on Elon Musk and Tesla.